Posted by Teresa Mihelic HelpDesk on Tuesday, May 14th, 2013 at 12:41pm. We get the question often, so here's some answers to the latest, to those of you who follow the Real Housewives of Orange County show and want to know about the exact communities featured in the show. The newest 'housewife' addition to the show, Lydia McLaughlin says she is renting where Alexis used to rent: the exclusive Ritz Cove in the Monarch Beach area of Dana Point. So what's it like at the Ritz Cove? The luxury Ritz Cove neighborhood of Dana Point is located in the northern side of the Rit z Carlton Laguna Niguel and the Salt Creek State Beach and Salt Creek park are the backyards for these custom estates. The Ritz Cove is a double gated community, and many of the homes offer spectacular white water, Catalina Island, coastline and 'The Links' golf course in Monarch Beach views, with private gates that lead to the beach, the park or the trail that interconnects this with the other neighborhoods in Monarch Beach. The residents here enjoy membership to the Monarch Bay Club restaurant and facilities as well as 'vip' treatment at the Ritz Carlton Hotel. Homes here range anywhere from $2M into the multimillion market - 20M+. As for Alexis, apparently she moved to a nice community in nearby San Juan Capistrano : the guard gated Marbella Country Club and golf Club. The neighborhood has around 250 custom estates, which most have views to the golf course. San Juan is home to the famous Mission, top tier schools, shopping and restaurants and close proximity to world-famous beaches and five-star resorts in South Orange County. 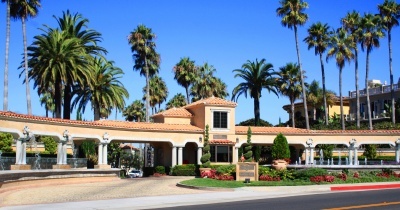 Though Marbella Country Club is very exclusive, it is not the only one in the area with custom homes, there's actually several San Juan Capistrano luxury neighborhoods, like the Hunt Club or Peppertree Bend. North of San Juan Capistrano, Tamra Barney moved into her fiance's home in the gated Covenant Hills neighborhood of Ladera Ranch. Ladera Ranch is the ultimate example of 'perfectly planned Orange County', a master planned community with many parks, pools and excellent schools. Within Ladera Ranch, there's one area that is gated, and has the only custom and semi custom homes within it, and that's Covenant Hills. Covenant Hills has upscale homes and includes multi-million dollar luxury estates that enjoy a private Clubhouse with pool and tennis courts in addition to all of Ladera Ranch amenities. Rumor also has it that Heather Dubrow sold her house... but we don't know yet where she headed to. Once we find out, we will blog and tell you about it. Meanwhile, enjoy the many beautiful homes of Orange County!